The Durbin Amendment has succeeded in driving down debit card fees merchants must pay, but retailers say it hasn't gone far enough. NEW YORK (CNNMoney) -- With every swipe of a customer's debit card, small businesses and other retailers must pay transaction fees to the card issuer. But those fees have been sliced almost in half, due to a government cap that was imposed last year, according to a Federal Reserve report released this week. The fees Visa (V, Fortune 500), MasterCard (MA, Fortune 500), Discover (DFS, Fortune 500) and several smaller companies charge for each debit card transaction now average 24 cents, down from 43 cents in 2009, according to the Fed. Before the cap was instituted as part of the Durbin Amendment, many small shops complained that transaction fees were excessive and cut into their revenues disproportionately. The amendment barely made it into the 2010 Dodd-Frank financial reforms after a bitter Congressional fight. Retail and grocery industry trade groups said this week that the measure has largely helped businesses. The cap, which went into effect Oct. 1, has pushed down costs and revealed just what each card processing company charges on average. "For the vast majority, this has been an improvement," said Mallory Duncan, a National Retail Federation lawyer who lobbied for the law's passage. Unexpectedly, some shops selling low-cost items have been hurt, trade groups say. As part of a push in the last five years to get dollar stores, coffee shops and the like to add swipe machines, credit card companies agreed to charge them transaction fees lower than other retailers. But those fees have more than doubled in recent months, reaching the 24 cent average like all other shops, Duncan said. So retailers selling 99-cent cups of coffee may now be paying almost a quarter in fees on a sale. Card companies "followed the rule but not the spirit of what the Fed said," Duncan said. Following the Fed's report, which was released Tuesday, the retail federation issued a statement saying debit fees haven't fallen far enough. According to the Fed report, Visa and MasterCard are charging shops 24 cents on average, while Discover's rate is lower, at 17 cents. A dozen smaller companies fall into a similar range. It's a sharp fall from what the big three were charging in 2009, when the average was 55 cents for each transaction. Today, the cap is set at 21 cents, plus a percent of the sale amount. In the age of plastic, the total amount buyers put on debit cards has grown. 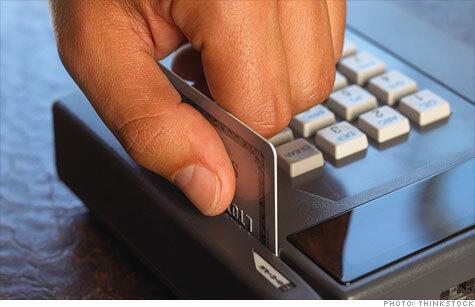 In 2009, $1.4 trillion was spent in 37.6 billion debit card transactions. Last year, $1.8 trillion was spent in 46.7 billion transactions. It's still unclear whether the savings from lower fees are being passed on to consumers. It's even unknown whether most shops have seen the savings themselves. Some have fallen victim to a legal loophole, according to Robert Day, managing partner of Merchant Relief Council, a Tustin, Calif., group which seeks to protect retailer profits. His explanation involves credit card processing companies, which fill middleman roles between shops and banks. "Debit card companies had to lower fees to processors, but there's no rule that says the processors have to pass that on to the merchants," he said. "They're pocketing that savings for themselves." Retailers are also having a hard time determining what they're being charged per transaction because what they pay is sometimes bundled with other fees, according to Tom Wenning, a lobbyist with the National Grocers Association. But it's better than the non-negotiable, unregulated rates grocers saw in the past, he said. "While it's not everything we'd hoped for, it was at least a step in the right direction," Wenning said. "This put in place at least some transparency."